We love smoothies. They are healthy, yummy and simple to make. And Yoplait has made it even more simple to make great smoothies. Until recently, I've always made smoothies using fresh fruit, yogurt, orange juice, and milk. They were always an after school treat. We just didn't have time to make them in the mornings before school. When I came across a coupon in the Sunday circular, I decided to give these a try. I still prefer to make homemade smoothies, but the Yoplait variety are definitely great when time is of the essence. Each package yields two (2) smoothies, each of which contains one full serving of fruit. 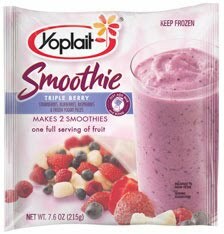 The Yoplait Smoothie is available in 3 flavors: Triple Berry, Strawberry Banana, and Strawberry Mango Pineapple. Our favorite is the Triple Berry. We've tried the Strawberry Mango Pineapple, but it didn't go over well in this house. My kids aren't fans of mango. Preparation is super simple, just add 1 cup of skim milk to the contents of the package and mix in a blender for about 1 minute. Each package retails for about $3.49, which may sound like a lot. But trust me, we have a handful of restaurants around us that make smoothies and sell them for about $5.00 each. So, $3.49 for two smoothies is a deal. Check out http://www.coupons.com/ for a $1.00 coupon. Disclosure: I was not compensated to write this review. I recently tried the aforementioned product and wanted to give my honest opinion to readers.